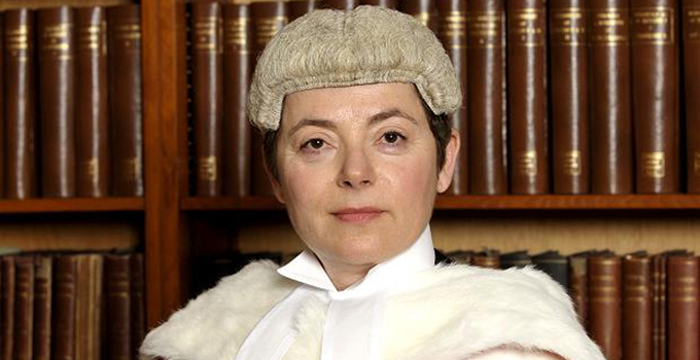 The Queen’s Bench Division (QBD) of the High Court is to get its first female president, with the news that Lady Justice Sharp will succeed Sir Brian Leveson, who is due to retire later this summer. Sharp studied law at Bristol University and was called to the bar in 1979. She took silk in 2001. Sharp received her first taste of life on the bench in 1998 as a recorder, a role she held for ten years. The 63-year-old was elevated to the position of High Court judge of the QBD in 2009 and was appointed vice-president seven years later. The QBD covers criminal matters and a wide range of civil claims including personal injury, negligence, breach of contract, libel and defamation. The former 1 Brick Court barrister’s appointment will not come as a surprise to our regular readers. As part of a predictions piece for Legal Cheek published to mark the New Year in January, top legal affairs journalist Joshua Rozenberg described Sharp as “the favourite” to replace Leveson. Leveson, 69, took up the position in October 2013 following the promotion of former QBD president, Lord Thomas, to the role of Lord Chief Justice of England and Wales. Sharp will start her new job on 23 June. The fact that she if female is clearly more important than her impressive legal career and otherwise suitability for the role. Are you suggesting there’s doubt that she’s a woman? Congratulations friend. Here’s a medal. We are pleased to award the above comment with the coveted Top (Top) Bantz Award, courtesy of our affiliates at Greenberg Glusker LLP. Per aspera ad astra! The thing I find most scary about the political pressure to appoint diverse applicants is not the underlying values it reveals. I don’t agree with such values, but I concede that a purely meritocratic system has its faults too. What I find terrifying is the abject obliviousness of those who support such policies. Rather than say, for example, ‘we recognise the tension with making appointments based purely on merit, but there are other values which should be taken into account’, they instead fail to recognise such tension in the first place. They genuinely think it is possible not just to give substantial weight to two different variables, but actually to maximise them both. As to Lady Justice Sharp, herself. Congratulations. I don’t mean to imply that such political pressure means that she, personally, does not deserve her new role. Well, it does seem to be an appointment on merit rather than a diversity hire. As pointed out in the article, she was his deputy and all the other candidates only had a couple of years left before they hit mandatory retirment. So she would seem the best of the available candidates. Good point. I wish I’d made sure not to criticise her appointment and instead criticised the political pressure in favour of diversity more generally. No you didn’t. Two paragraphs on why in your opinion appointments are not been made on merit are not negated by just saying in the last line, that you did not mean to imply that her appointment was not on merit. That is what the rest of your post did imply. Unless you have difficulty with what the word imply means. If a bloke had been appointed would you have written two paragraphs expressing concern that people are only being appointed because they are blokes and then cavet it with saying in the last line that don’t mean to imply that he didn’t deserve the appointment? Ok. So, first, my comment wasn’t really a response to the article, it was a response to the comment from Anonymous @ 11.18am. That commenter was chastising LC’s obsession with Sharp LJ’s gender rather than her suitability for the role. I was building on that by commenting on a broader phenomenon – namely, the fact that some people care about people’s gender/ethnicity/sexuality etc when making appointments. Secondly, I never contended that appointments are not made on merit. Rather, I said that merit is not maximised when people take into account variables besides merit. Thirdly, you are quite right to say that my first two paragraphs could be taken to imply that Lady LJ’s appointment was contaminated by considerations other than merit. That is exactly why I added the last paragraph. It was to make it abundantly clear to anyone reading that I did not mean to imply that. To say that my last paragraph did not serve to negate any mistaken understanding on the part of the reader, however, is an interesting view. What should I have said instead? Or perhaps the issue isn’t Sharp LJ at all. Perhaps it is that you object to the substance of my comment which, as I made clear, wasn’t directed towards her appointment at all. A lot of the SJW types would argue there is no such thing as a ‘purely meritocratic system’. They would say that the system is inherently based on power rather than merit, so competent women will be suppressed and incompetent men promoted. ‘Meritocracy’ is simply an explanation used by the powerful to mask the oppression they carry out. Some would go as far as to say that everyone is basically of the same ability to start with and that it is simply their preferential or ill-treatment based on your status as part of an oppressed group or not that determines how you do in life (this is a fringe group numerically but they are an important part of the people who write the literature). While you adopt a multi-factorial approach where you can weigh different factors like merit and diversity against each other, they would disagree. To them, there is only power and groups trying to attain it. Don’t make the mistake of thinking you are even playing the same game as these people. You are not. However, any effort to suggest you are not playing their game is simply evidence you are but are attempting to conceal it to protect your own power. Yeah, but could she get a TC with Greenberg Glusker? Depends if she could solve a Rubix Cube whilst blindfolded, such is the primary assessment for said TC. Can’t wait for the first transitioning judge. The best candidate rightly got the job. The fact that she’s the first female President of the QB is noteworthy, but the gender of any subsequent Presidents of the QB is irrlelevant as gender isn’t a barrier to attaining the position. Her academic and professional background suggest otherwise. This was a politically motivated appointment. Really? Has the position of President of the QB ever gone to someone other than the existing Vice-President of the QB? © Copyright 2019 Legal Cheek Ltd. All Rights Reserved.